1997: Dale Earnhardt’s famous No.3 Goodwrench sponsored car was to be the first NASCAR car to be released by Scalextric. In the 1990s, Dale Earnhardt Snr was the man to beat on the NASCAR oval and circuits. Earnhardt, known as ‘The Intimidator’, was a hard charger and had a huge fan base through winning the NASCAR ‘Winston Cup Series’ championships between 1975 and 1994 a record breaking seven times. Scalextric took the decision to go with a new racing theme and Dale Earnhardt’s car was to be the first one to market. In 1997, SCALEXTRIC released their first take on North American Stock Car racing with a range of Chevrolet Monte Carlo and Ford Thunderbird cars. It was a ‘toe-in-the-water’ moment for Scalextric as they had not previously released NASCAR model racing cars. There was, rather obviously, a large market potential waiting to be tapped. NASCAR racing has always been a huge spectator sport in the USA but, for the rest of the World, the final decades of the 20th century began to see widely available broadcasting of NASCAR races. Our awareness of the cars and drivers grew with such manufacturer names as Pontiac, Dodge, Chevrolet, Ford and drivers Earnhardt and Gordon – and, I’m sure for many fans, this list would more-or-less be endless. Drivers and cars were deeply associated with commercial branding such as Dupont, Valvoline, Kellogg’s, etc. so one’s allegiance may be with a driver, car or brand. Would SCALEXTRIC find a fruitful market? The answer was ‘YES’ but it wouldn’t be an easy road for Hornby Hobbies even though the commercial feedback from the USA and European retailers suggested that NASCAR slot cars would be good for 32nd scale racing. From 1997 to 1999, SCALEXTRIC released the Ford Thunderbird and Chevrolet Monte Carlo in a one-piece body format and generic chassis with stronger ‘down-force’ magnets. They were not particularly refined or accurate, indeed they used the F1 front hubs and tyres from the ‘Team’ single-seat range, but they did provide a racing theme that had not been available before. The well-known brand names were there; Ford, Chevrolet, Valvoline, Kellogg’s, Kodak, Exide and their drivers. There were already different versions of the same ‘C’ number which caught the interest of the serious collectors with the Kellogg’s chicken ‘looking left’ or ‘right’ on the famous number ‘5’ car of Terry Labonte. With as many as fifty-plus cars on the famous US ovals and road courses, SCALEXTRIC would find it impossible to meet demand so plain black and white versions were also released to allow racing or modelling enthusiasts to decorate their own cars with 1/32nd scale waterslide decals. There were some car liveries that never made it to market including the one that everyone wanted – Dale Earnhardt’s famous No.3 Goodwrench sponsored car! Due to licensing issues the car was never released and the plain black or white issues were eagerly seized to allow fans to decorate their own ‘Intimidator’ car livery. Business-to-business activity had also begun with a ‘BRYAN’ #30 sponsored car which was sold in sets in the USA by the sponsor and team. This red and black liveried SCALEXTRIC car is very hard to find. Other proposed liveries included sponsors such as PEPSI and CARTOON NETWORK amongst others. This first clutch of NASCAR cars were part tampo-printed and came with an additional sticker sheet. This was partly due to keeping the cost of dozens of tampo-print operations down to a minimum so that the car could be recognized with a basic livery and a single sponsor decoration and with an accompanying sticker sheet with the many minor sponsor logos. They were robust and colourful cars though they may not have survived this initial arrival to the slot car market-place if it hadn’t have been for the arrival of a new slot car manufacturer called FLY. This new manufacturer from Spain raised the bar in terms of design, handling and decoration. SCALEXTRIC had to respond. They did, quickly! SCALEXTRIC released the FORD TAURUS and PONTIAC GRAND PRIX and, this time, the car was much more detailed with a driver pan and driver, NASCAR wheel hubs and a switch-over to full tampo printing and stronger bar magnets. For the NASCAR fan, and with nearly twenty different liveries issued during the next two years, the favourite cars were on the grid with liveries from McDonalds, Valvoline, Home Depot, DeWalt, Exide, Tide and others. If this wasn’t enough to feed the insatiable appetite for US stock cars then there were a further re-liveries of these cars each year. The 1999 TAURUS model was replaced with the 2001-shape TAURUS car with a further ten liveries but now with a full driver interior and a side-winder motor configuration. The side-winder chassis layout was another foray in to the unknown as Scalextric were normally ‘in-line’. For the collector, the Pfizer #6 car is difficult to find. The CHEVROLET MONTE CARLO, released in 1999 spawned an incredible fourteen liveries with STP #43 and LYCOS #10 being particularly hard to find now. There were multiple versions to collect if following the driver, the sponsor or the car brand. The most prolific liveries are of Tide, Exide and Valvoline. Plain white models were released with the introduction of every model release to offer the option of decorating cars – replicating the real-world liveries or one’s own creations. 2005: ‘Tide’ floods the market. Other slot-car brands couldn’t let Scalextric have the pie all to themselves and quite predictably slot car manufacturers SCX and Carrera released NASCAR cars over the coming years very successfully at first. It wasn’t too long before the market was saturated with 1/32nd scale slot cars and all three manufacturers were struggling to sell through and bargains were available for slot fans. On track, driver Jimmie Johnson was challenging Jeff Gordon for the championships and the Lowes #48 and Dupont #24 became a CHEVROLET staple in the SCALEXTRIC range – and the final pickings in a decreasing market affecting the hobby in general. The 2005-shape TAURUS was released with only a further two liveries. As with many sports such as F1, there is a ‘silly season’ in NASCAR when drivers, teams, sponsors and manufacturers end and begin new contracts. This presents problems for all merchandisers in the form of licensing with huge corporations involved in NASCAR, legal machinations can over-run. This can have a domino effect reaching down to the comparatively small minnows in the pond. Toy and model manufacturers may have worked on models and decoration over the Winter on the assumption that the teams would continue as per the prior year. Minor sponsor changes can be accommodated but sometimes mid-season changes can scupper plans as happened with the 2005 Chevy Monte Carlo teams of National Guard, Kellogg’s and US Army (C2892 and C2895) which were announced in the catalogue but were not released. 2008: …and now a drought! Having had such a good run with releasing these cars in recent years the slot car manufacturers were finding it difficult to sell the remaining stocks around the World. Carrera and SCX jumped out of the game. Collectors and racers enjoyed a bonanza for nearly a decade and after a two-year drought of new releases from SCALEXTRIC, demand for the cars was still evident and, surprisingly, a final model was released in 2008 in the form of the CHEVROLET IMPALA. The model was released in the form of the ‘Car of Tomorrow’ (COT) shape CHEVROLET IMPALA with nine releases. Familiar names, sponsors and car numbers appeared; such as Gordon, Johnson, and brand names Kellogg’s, Lowes, Dupont and National Guard. 2009: Ending the race with Earnhardt Jnr. Perhaps, the most notable and quite coincidental name to appear in final batch of releases is the famous racing family name of Earnhardt. Son of Dale Earnhardt (Snr), Dale Earnhardt Jnr drove the #88 IMPALA with the National Guard livery. The car of father Dale (Snr) was the first livery proposed for release back in 1997 but was cancelled at the beginning of the bountiful decade of NASCAR releases. Amongst the final SCALEXTRIC NASCAR models issued featured as part of the PRO PERFORMANCE kit range. The kit provided a plain white IMPALA body, glass, chassis, driver tub, driver and all the running gear, motor, wiring and guide blade parts to complete the kit with, of course, the option to decorate as required. From the first NASCAR releases, credit has to go to SCALEXTRIC USA who were principally involved, naturally, in recognising the demand for decorated and plain white cars. Since NASCAR grids in the real world were huge, not every fan was going to be catered for even though SCALEXTRIC released over 50 liveries plus many variations during the period. Plain white cars were popular for replicating cars by modelling with spray painting and water slide decals. Many NASCAR liveries (real world) were one-off decorations. In fact, it is common, not only in NASCAR, but from F1 downwards, cars will often have sponsor and decoration changes from one race to the next whether they are minor sponsor amendments or complete livery changes. Using the plain white-bodied releases, slot-racing fans can decorate a car body in a very specific livery such as STAR WARS, SUPERMAN, SCOOBY-DOO or from an incredibly wide selection of alternative water-slide decals available around the World. For now, with no slot car manufacturers producing NASCAR car, fans will have to be satisfied with creating water-slide creations, collectors can finally complete their collection and racers & clubs will have to be satisfied with the diminishing availability of models and liveries. Racing NASCAR slot cars is great fun as they are generally very robust models whilst collecting the models gives a very colourful presentation to display of the famous drivers, cars and brands. Sadly, though, not Earnhardt #3! 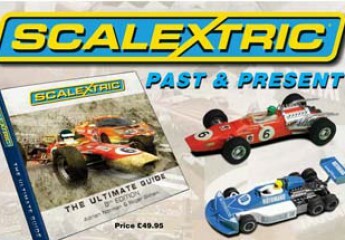 “Scalextric – The Ultimate Guide 8th Edition” book, with over 700 pages, is available from the Internet. Search online!